Presenter: As your CEO, I'm proud to set a new direction for our company. Presenter: Upgrading our desktops would have cost $10 million. Presenter: Instead, we will migrate to the cloud for only $1 million. Presenter: That leaves $9 million for employee bonuses! Presenter: Our cloud provider has persuaded me that upgrading our desktop OS first will give us improved TOC and enhanced cloud sharing. Second Man: I'll have my staff get the desktop upgrades started right away. Presenter: Members of the board, our upgraded desktops make the cloud superfluous. 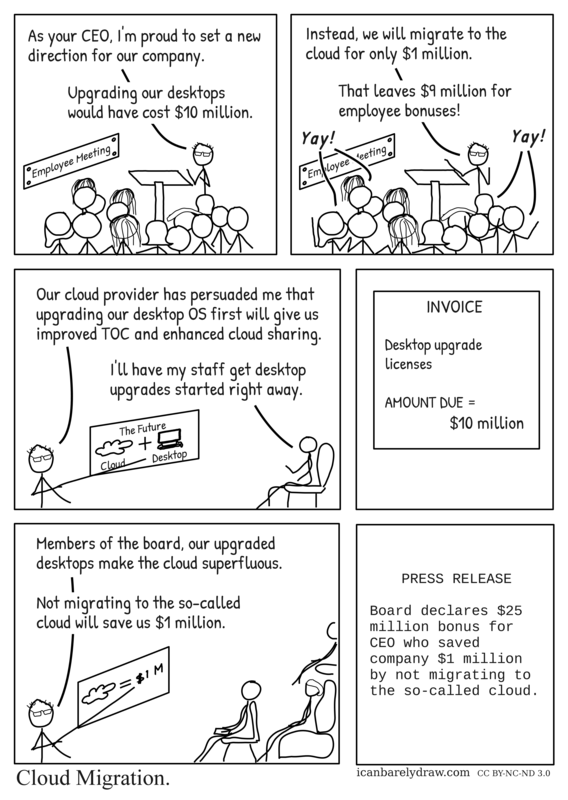 Presenter: Not migrating to the so-called cloud will save us $1 million. Board declares $25 million bonus for CEO who saved company $1 million by not migrating to the so-called cloud.